Bialetti, the leading Italian coffee and cookware brand, recently announced the launch of its "Bialetti's Italian Getaway" Sweepstakes with Chef Fabio Viviani, where fans can enter for a chance to win a trip for two to Los Angeles where they will meet their “top chef” Fabio Viviani. One lucky winner will receive a trip for two to Los Angeles, where they will stay at the Hilton Universal, just a stone’s throw from Hollywood, California. During the 2-night stay, the winner and his/her guest will attend one of Chef Fabio’s cooking classes and learn firsthand how he plans, prepares and serves his favorite Italian recipes. The winner will also receive a $200 gift certificate redeemable at Chef Fabio’s restaurants, Café Firenze or Firenze Osteria; plus one 8-piece Bialetti Aeternum cookware set. Tea industry leader John Harney, founder of Harney & Sons, took the spotlight at the World Tea East, held Sept. 9 - 10 at the Pennsylvania Convention Center in Philadelphia. Harney was presented with the Cha Jing Lifetime Achievement Award from World Tea Media, organizer of the new regional convention, for his significant contributions to the tea industry. At World Tea East, Harney received the Cha Jing Lifetime Achievement Award before a crowd of his peers, to recognize the considerable contributions he made to the growth, innovation and education of the specialty tea industry throughout his career. Harney accepted the award during a special reception, where U.S. tea professionals from the east coast as well as numerous international delegates congratulated him. George Jage, president of World Tea Media, said, "John Harney is celebrated and widely respected by his peers. He's a role model for many, and he's made a significant impact on the specialty tea industry through mentoring and service. We're thrilled to recognize him as the first recipient of World Tea Media's Cha Jing Lifetime Achievement Award." Michael Harney, vice president of Harney & Sons and a second generation master tea blender, said, "I am extremely proud of my father and delighted that he was recognized with this significant award at World Tea East. I joined my father's tea company in 1988 as its second employee, and it's been an amazing adventure as his partner in pursuing and finding the best teas from around the world. My dad is passionate about great tea as an everyday luxury, and it's been amazing to see how he's impacted other tea professionals, businesses that serve tea and the industry at large." Author and tea pioneer James Norwood Pratt, who presented Harney's award at World Tea East, noted, "Nobody in the world of specialty tea is more loved than John Harney, and nobody has contributed more to the industry. If it's possible for a lifetime achievement award to be overdue, this would be the example." World Tea East participant Pearl Dexter, the editor and publisher of TEA A MAGAZINE, said, "John Harney has been an inspiration for tea entrepreneurs. His love for people and tea has touched the heart of many. John exudes kindness, love and laughter." S&D Coffee, the largest U.S. food service coffee roaster, is launching a line of shade-grown, organic, Fair Trade-certified coffee that is also certified to the Smithsonian Migratory Bird Center’s “Bird Friendly” coffee program at all 48 of Hanover, MD-based High’s of Baltimore convenience stores in Maryland. The move will enable drivers to experience a true high end specialty coffee while supporting efforts to retain winter bird habitat. The announcement comes at the beginning of the annual fall migration during which birds such as the Baltimore Oriole head south for the winter. Bird Friendly coffee (BFC) is certified organic coffee produced on farms with a shade cover that provides vital habitat for migratory and resident birds in tropical landscapes which are increasingly threatened by deforestation globally. The Bird Friendly criteria are the world’s most stringent stan dards for shade-grown coffee production. Migratory birds are not only beautiful with vibrant songs, but are integral to tropical and United States ecosystems alike, helping with flower pollination, and seed dispersal, along with insect and pest management. “North American farms benefit in many ways from migratory birds’ return each spring, helping to guarantee our food supply” said Dr. Robert Rice, coordinator of the Smithsonian Migratory Bird Center (SMBC) Bird Friendly program. 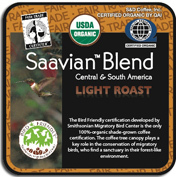 The coffee will be sold under the Saavian (Save the Avian) label. High’s of Baltimore has been selling S+D’s Buffalo & Spring brand Fair Trade and organic-certified coffee since 2007. The company found that by switching to organic and specialty grade coffees, its coffee sales have increased 40 percent. BFC sales are on the rise in general. According to an SMBC report released earlier this month, The Global Market for Bird Friendly® Coffee 2010, estimated sales of BFC rose 166% from about $1.5 million in 2005 to more than $4 million in 2010 with US and Japanese markets equal with respect to global market shares. The years 2008-20 10 saw a 25% average annual increase in volume roasted and sold in the North American market. There are 46 roasters in the U.S., Canada, The Netherlands, and Japan that carry BFC provided by 16 importers. Guatemala ranked first in terms of production (28%), and, with Peru (25%), Mexico (20%), Nicaragua (15%), and Columbia (8%), the five countries account for 96% of all the BFC certified globally. These ready-to-drink teas are packaged in plastic (PETE1) Bottles, which can be recycled, or made into egg-packs, fiber, tote bags, clothing, furniture, carpet or other items. In fact, recycled PETE bottles are even used to make uniforms for ITO EN sales force in Japan. Reducing packaging has always been a central goal for ITO EN, achieving amazing results by continuously reducing the bottle's mass. This year, the individual bottles are lighter by 0.16g than last year. A distinct leader in this regard, the bottle is one of the lightest in the beverage industry. By choosing plastic bottles over glass, the company has been able to ship more tea in individual shipping trucks, resulting in savings in fuel expenses and emissions. Gardens are inspiring in the way they show continual growth, renewal, and vitality. Love, tenderness, and care help to nurture a garden. It is in Jane's memory, a lifelong friend of Harney & Sons and an avid gardener, that Jane's Garden Tea was blended intending to show love, care and tenderness during her battle against breast cancer. Jane’s Garden Tea is an artfully crafted blend of green tea and roses. 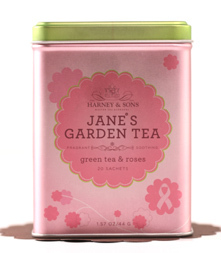 This year we are happy to offer Jane's Garden Blend in a beautiful new pink and green tin with 20 sachets inside. One dollar of the proceeds from the sale of these tins will be shared by the Jane Lloyd Fund, and the National Breast Cancer Foundation. The Jane Lloyd Fund helps cancer patients with their day to day expenses while battling cancer. The National Breast Cancer Foundation provides mammograms, education and research about breast cancer across the country. 20 sachets; $9.00. Click here to order or to find out more. Help support the Breast Cancer Network of Strength with the purchase of this Bentley's "Tea Leaves For Life" Assorted 48 Count Tea Collection. Uniquely packaged in signature pink, the special breast cancer selection of premium estate Chinese green tea boast flavorful fruity blends such as Papaya, Mango, and Raspberry. Green tea is rich in antioxidants! Bentley's will donate $.75 donation for each box sold. $6.99. Click here to order. This season, Starbucks celebrates a coffee that also demonstrates the company’s commitment to community: Gold Coast Blend® – Morning Joe Edition. 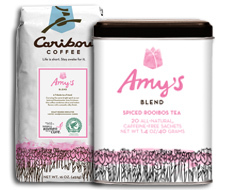 This coffee, a partner (employee) and customer favorite, was introduced in grocery stores in 2009 to honor the Company’s relationship with MSNBC’s “Morning Joe” program and the shared interest i n education and community involvement. Now for the first time Gold Coast Blend® – Morning Joe Edition whole bean coffee will be featured in Starbucks U.S. retail stores. Beginning Oct. 4, Gold Coast Blend® – Morning Joe Edition will feature a $5 donation card to DonorsChoose.org allowing customers to donate directly to a school classroom project of their choice. DonorsChoose.org is an online non-profit organization that allows public school teachers across America to post classroom needs online and gives individuals the ability to contribute directly to a specific project. The source of this blend’s impact inside the cup is a secret recipe of Latin America, Asia/Pacific and dark roast coffees. The interplay of these very different coffees weaves a deep and densely rich, complex taste, with waves of flavor unfolding as you drink it. www.starbucks.com.